This is delicate and gorgeous image derived from turquoise - a gemstone that has been highly valued for literally thousands of years. Pliny the Elder referred to it, and the Aztecs knew it as chalchihuitl, but our word dates to the 17th century from the French turquois because the mineral was first brought to Europe through Turkey, although it actually came from Persia (Iran). 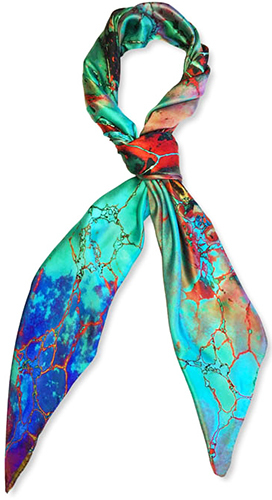 More importantly, it makes a wonderful scarf at this large size where the details can be fully appreciated, and the colours shimmer and shine on this, our highest quality China-sourced silk. And we think we can get away with describing some of those colours as violet. We hope you agree.